According to the Summer Institute of Linguistics, more than two-thirds of the world’s children are bilingual; in America, however, only 17% of the total population speaks a second language in addition to English. While America has been sympathetic to other languages historically (we are the land of immigrants, after all), their use is generally transitional and limited to one or two generations before being replaced by American English. Today, only a few of the world’s languages exist in U.S. schools and are taught to a limited number of students for a short time. While some Americans resist the idea of speaking a foreign language in the United States, believing that only English should be spoken, their attitude ignores the reality of life in the United States and the world. The estimated Hispanic population of the country was 52 million as of July 2011, making people of Hispanic origin the nation’s largest ethnic or race minority. Hispanics constituted 16.7% of the nation’s total population and are expected to grow to 30% of the population (132.8 million) by 2050. Whether we like it or not, the Spanish language will continue to be spoken here and throughout the world for the foreseeable future. Spanish is one of the most widely spoken languages in the world, with more than 400 million speakers in North, Central, and South Americas. It was here before English, its presence in North America preceding the founding of the United States. In isolated mountain communities of New Mexico and in towns on the Mexican border, Spanish has been spoken continuously for hundreds of years. Spanish is the native language of Puerto Rico; Puerto Ricans are native U.S. citizens. Worldwide, there are more Spanish speakers than English, ranking only behind the languages of China and India. Learn About Other Cultures. Modern humans live in a small, interconnected world. Events in Beijing, Brussels, and Bogota can affect Americans living in Boston as easily as events occurring in Atlanta or Detroit. Speaking a foreign language opens doors to understanding, and opportunity beyond physical borders or long distances. Develop Creative Thinking Skills. One study suggests that the brain functions of children who speak two languages stay sharper as they age by keeping the mind active in a manner similar to puzzles and games. Children who speak two or more languages show a heightened capacity to focus, ignore irrelevant information, multitask, and communicate beyond that of monolingual children. Get a Job as an Adult. Mexico is the 11th largest economy in the world; according to the U.S. Census Bureau, it is the second largest trade partner for our exports ($124 billion as of July 2012) and the third largest source of imported goods behind China and Canada ($162.9 billion as of July 2012). Mexico is our single greatest agricultural trading partner, while we are Mexico’s largest trading partner for all goods. 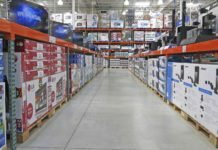 It and other Latin American countries, most of whom speak Spanish predominantly, are the fastest growing trade segment for the United States. 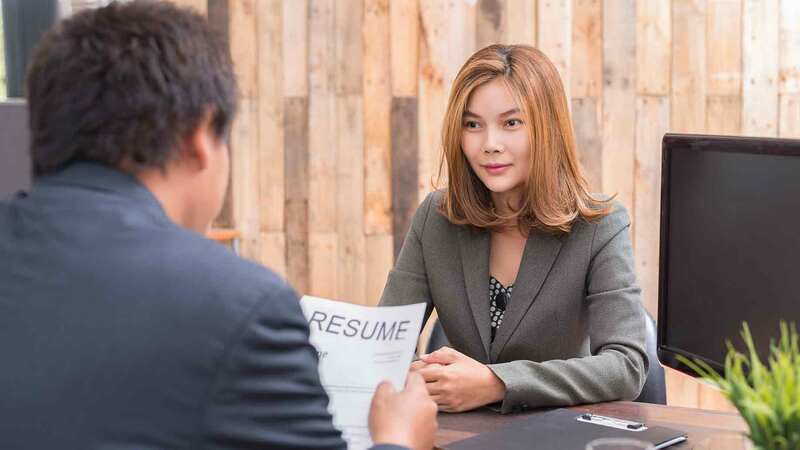 Being able to communicate with businesspeople in their native language is a major asset for job seekers. Mega-infrastructure projects – such as dams, highways, and airports – have been announced throughout Latin America, attracting major U.S. construction firms. Furthermore, the medical and pharmaceutical industries are being emphasized by many of the countries, while tourism between the countries will continue to grow. Perhaps the best way is the way children learn: First by listening, then by repeating or speaking. Little by little, children learn vocabulary, then reading and grammar. We are born with the capacity to make 40 sounds, and our genetics allows our brain to make associations between sounds and objects, actions, or ideas. The combination of these capabilities led to language as we know it. Sounds come to have meaning. The babbling sound “ma, ma, ma” of the infant becomes mama, and then mother. In the first years of life, children listen, practice, and learn. The amusing sounds of a young toddler practicing language (in seemingly meaningless chatter) is really their modeling of the rhythm, tone, volume, and nonverbal expressions they see in us. The earlier you introduce your child to a foreign language the better; it seems that before the age of 10 is ideal, or even before the age of 5, if possible. When young children are exposed to other languages and cultures at a very young age through books, videos, songs, and objects, they have the opportunity to feel comfortable growing up in a world where languages and cultures intertwine on a daily basis. Nursery Rhymes and Songs. Younger children react positively to the repetition and melody of nursery rhymes and songs, even though they don’t understand the words. Programs like “Sesame Street” or tapes of familiar tunes like “Ten Little Fingers” expose the language and rhythm of Spanish as part of play. Story Tapes. Search for your child’s favorite story in Spanish. Even “Sesame Street” and “Dora the Explorer” have been translated. Read the foreign language version along with your child, or play the CD that narrates the story for you both. Indi Avila’s book, “Sana Sana,” an illustrated story of a young girl named Lucia, is especially popular with children with its colorful pictures. Word and Picture Cards. Using word and picture cards is a basic, but great way to learn and remember vocabulary, as it is much easier to remember a word when associated with a colorful image. Simply write the name of an object in the target language next to a picture of that object. Then, stick these cards around the house for constant exposure, or bring them out as a game to name objects in the house or garden. For example, you might place a card with the word “baño” on the door of the bathroom, or “juguete” on your child’s favorite toy. Nannies and Tutors. Exposing your child to a native speaker is a great way of introducing Spanish. Local foreign students usually have superior grammar and and may not charge exorbitant rates. Be sure, however, that the tutor you choose is comfortable with and enjoys interacting with children. Learning Spanish should be natural and fun, not a series of enforced lessons. Spanish Television or Radio. Like television in the United States, most programming is aimed at an older, more sophisticated audience. As a consequence, a child may be bored and may be exposed to adult themes. If you decide to try television, you might visit the website TVE a la carta for suggestions about programs suitable for young children. 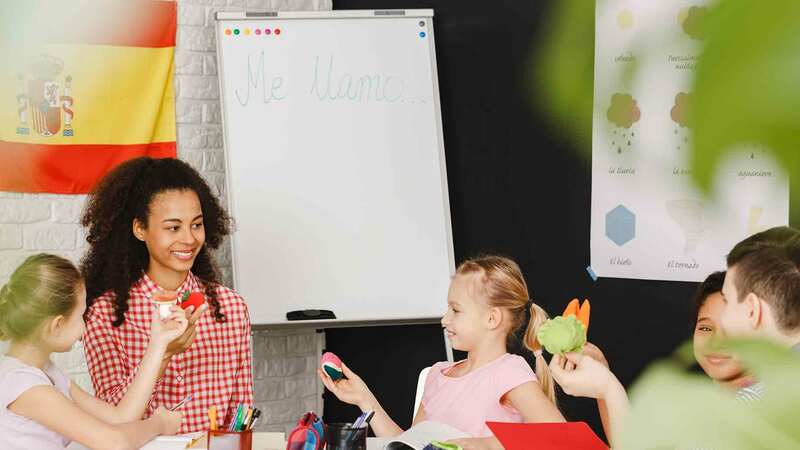 Educators generally concur that children should be introduced to a second language early in elementary school simply to allow for a longer sequence of instruction, increasing the likelihood of true proficiency. Simply put, the more years your child is regularly exposed to the Spanish language, the more mastery of the language. In addition, children are more open-minded in general during elementary school than later, as well as being more interested in learning and more enthusiastic about other cultures. Many countries mandate the introduction of foreign language in schools by age eight, while students in the United States often wait until junior or senior high school for their first exposure to a foreign language curriculum, thus only having 4 years of study versus 10 or 12 years when introduced earlier. If your child’s school doesn’t offer foreign language classes, you can use the Internet, as a multitude of texts, sounds, visuals, and animations are available to anyone with a computer, tablet, or other smartphone. Applications like Spanish Speech with Milo, Learn Spanish by MindSnacks, and PlaySay Spanish are fun and effective. Hello-Hello.com offers a variety of language courses for multiple devices free that are entertaining as well as educational. As your child progresses through school, you can encourage him or her to take formal classes offered in junior high and high school to build his or her reading and formal speaking vocabulary. 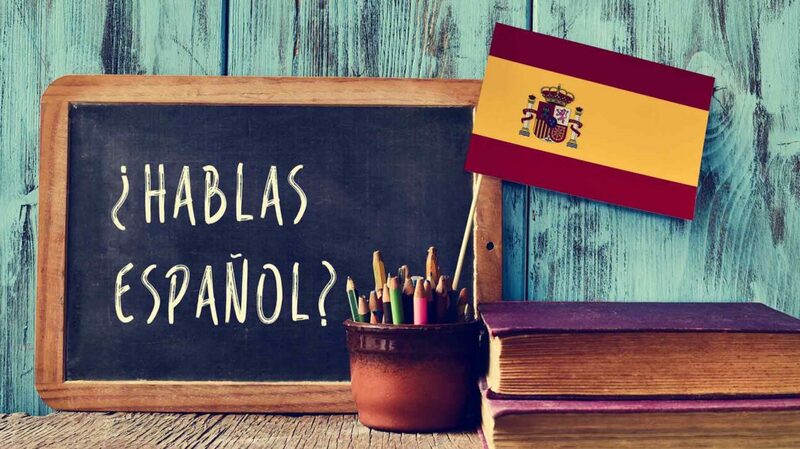 Many schools offer extracurricular clubs in foreign language, which supplement formal language lessons with the rich history and culture of the countries where Spanish is spoken. When your child is in high school, you can also explore one of the many foreign exchange opportunities through International Student Exchange Programs for your child to further enhance language abilities. After graduation from college, young men and women can extend their language capabilities by volunteering in the Peace Corps, a 27-month program in a foreign country, during which they will be paid and may receive a significant cancellation of student loans. Learning Spanish is personally enriching, gives insight into other cultures, and is an advantage in almost all careers. If you decide to introduce Spanish to your child, remember that learning another language needs to be fun – otherwise, it is hard to stay committed. You need to celebrate their small achievements as they progress, and be ready to encourage them when they have an inevitable setback. Do you speak Spanish or another language in addition to English? Has it been useful?